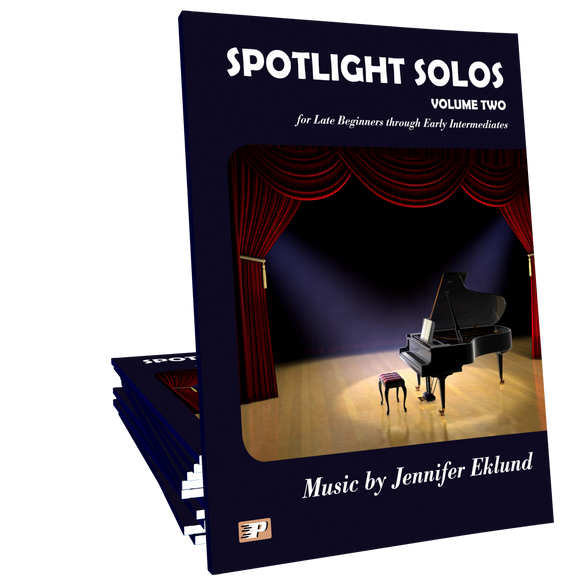 Spotlight Solos Volume 2 features 12 recital-ready fun solos by Jennifer Eklund for students at the late beginning through early-intermediate levels. This book is included in the NFMC Bulletin for July 2016 - June 2020. I recently had a 13-year-old girl switch from another method to Pronto. She loves the songs in Spotlight Solos Vol. 2, and says that she thinks she's learning to read music better now! 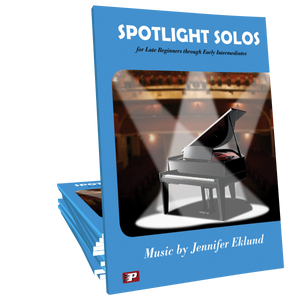 Captivating solos that your teens will fall in love with, nothing says "student saver" like Spotlight Solos! Watch your students' eyes light up as they hear these pieces. Jennifer Eklund composes STUDENT SAVERS!! More inspiring and fun to play pieces that reinforce pedagogical concepts! My tween and teen students go nuts for these. As a teacher, these are MY secret pleasure to sit down and play. Entertaining, fun and useful. Wins every time. My students love this book! This is great to keep those hard workers playing flashy and fun songs. They are composed well to play easily and still sound fun. Whirlwind is a favorite! This book is a wonderful addition to my studio. My students love to play these songs. Several of these songs were played this year for recital and everyone loved them! Love this sheet music. Purchasing the MP3 music along with the sheet music has made a huge difference with my piano lessons. 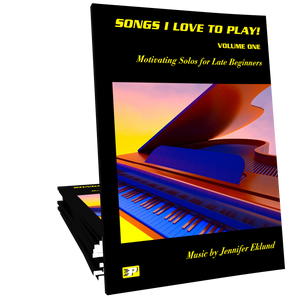 The music and rhythm of the songs make learning to play piano fun. My adult students are loving this music book. They’re engaged, practicing and enjoying the sounds. I bought hard copies of the Spotlight Solos Book 1. I couldn’t stock it fast enough to please my students, so I bought the unlimited reproductions license for Spotlight Solos 2. I have not regretted it! Students of all ages gravitate to this music! They are learning great rhythm while enjoying the music so much that they PRACTICE!! 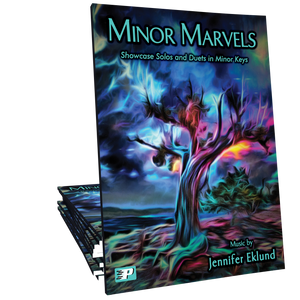 This book does not have 1 or 2 great pieces with other filler pieces – it’s stuffed full of pieces my students love! I bought this book as soon as it became available because Spotlight Solos Book 1 has been such a hit with my students. My 11yo daughter dove into it right away and chose two pieces to perform at our recital this spring — they were an enormous hit. My daughter regularly asks me to teach her a new piece from this book and she has a hard time deciding which piece to start next since she loves them all. It’s time for me to invest in more of these books and get the rest of my studio into them!